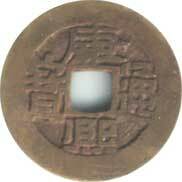 Americans, when asked about coins with holes in them, probably picture the old Chinese "cash" coins which are featured so prominently in Chinese-style decor. These coins had a square-shaped hole in the center, with Chinese characters around it. The United States has never had a coin with a hole in it, so it's not something we're used to seeing. Plenty of other countries, however, have had one or more of this type of coin (known as "holed coins" or "holey coins") in their recent history. As far as I know, the holes put into modern foreign coins don't serve any specific purpose. They are not there to make the coins work in a particular machine, or to be easier to carry (although they would be slightly lighter than a coin without a hole). The main reason that you would make a modern coin with a hole in it (or, for that matter, with an unusual shape), besides pure decoration, is to make it more easily distinguishable (by touch and sight) from other coins in circulation. Most coins that have holes in them have a relatively small hole - usually 1/4 of an inch (6.3 mm) or smaller. The hole is meant to be seen and felt, but not to be worn like a ring (wouldn't that be interesting?). 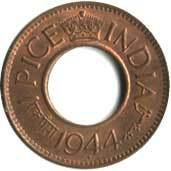 The one exception I've seen is the 1 pice coin from India and Pakistan in the 1940s, which had a 3/8 inch (9.5 mm) hole in a coin that was less than 1 inch (2.5 cm) across. It gives the coin a unique look, like you could almost wear it as a ring. On coins that intentionally have holes in them, the hole is always in the direct center of the coin, and usually the design of the coin incorporates the hole (so you don't have a hole directly in the middle of a person's head, for example). If you see a coin that has a hole near the edge, or has multiple holes (see pictures), someone has drilled a hole in the coin in order to use it for decoration or jewelry. A single hole near the edge means that the coin may have been worn on a necklace or bracelet. Two holes toward the center of the coin, such as the one pictured, indicates that it may have been used as a button on a piece of clothing. This kind of destruction makes the coin worthless to collectors. 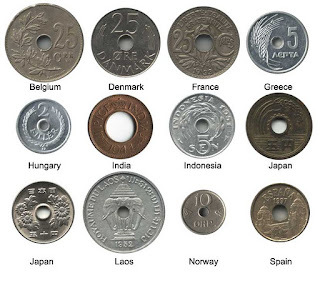 I believe that the only country currently using coins with holes is Japan, whose 5 yen and 50 yen coins both have holes in the center. They are also nearly the same size (the 5-yen is bigger), but the 50-yen coin has a reeded edge while the 5-yen has a smooth edge. The 100-yen coin is the same size as the 5-yen, but with a reeded edge; so the hole in the center helps to make the 50-yen more noticably different than the 100-yen. Besides Japan, many countries in Africa, Asia, Europe, and the Middle East have used coins with holes in the recent past, and you might be surprised by who they are. Spain added a hole to their 25-peseta coin in 1990 and kept it until switching to the euro in 2002. Hungary had a hole in their 2-filler coin, used from 1950 until 1992. Greece had holes in their 5-, 10-, and 20-lepta coins from the 1950s until the 1970s. 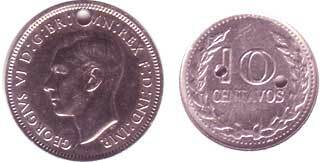 Fiji had holes in their half-penny and penny in the 1930s through the 1950s. Here is a list of the countries that I've found that have circulated coins with holes since 1900. This is definitely not a complete list, so I will update it when I find out about other countries. And since I bet that you readers know of examples that I haven't listed, I'm going to turn on blog comments this month - so post any countries that are missing from this list (list specific denominations and years if you can). Looking for coins with holes to add to your collection? 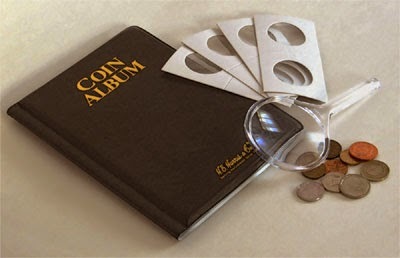 Check out our Coins With Holes Set.